Posting on social media won't get your more social media fans. It's the quality of the posts, and not necessarily posting more often. A recent Clickable study that looked at major consumer brands shows that more posts never equaled more fans. Clickable studied multiple industries and a lot of major consumer brands, comparing the number of posts that those brands had made in relation to their number of social media fans. In most industries, we found that the number of posts that a brand has made doesn’t necessarily translate into more fans. We studied the social media fans and the number of posts that each of these brands had. None of the brands that had the most posts had the most fans. So, what we learned is that posting more often on social media doesn’t translate into more fans on social media. The study concludes, "For consumer brands: When it comes to Facebook or Instagram, posting more often on these platforms doesn’t necessarily mean an uptick in fans. We looked at a lot of the posts that brands are posting, and while there are some good ones that get a lot of fan engagement, those posts didn’t necessarily lead to more fans on Facebook or Instagram. Consumer brands, such as Colgate and Unilever had, by far, the most user posts than any other brand that we analyzed. Colgate is a master in taking a mundane message – promoting dental hygiene – and expressing it in creative posts. A great picture that creatively ties in with the brand and a memorable hashtag are key to posts generating a lot of comments and engagement. Care must be taken that user posts are calibrated for their sentiment, and responded to quickly if they trend towards the negative." 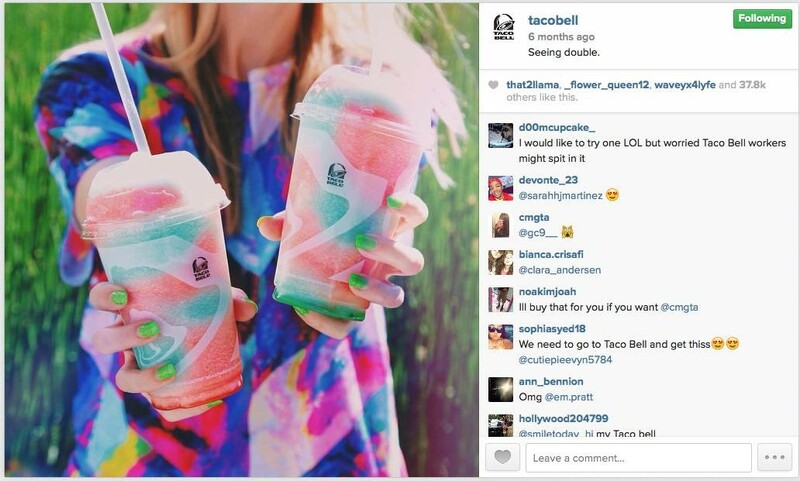 Photo via Clickable: Taco Bell had the 2nd most engaged Instagram post, called “seeing double”: his Taco Bell post on Instagram had over 36,000 Likes during 2014, and a lot of comments. Even though there were a lot of comments, I’m not so sure Taco Bell is doing such a great job at moderating those comments on their posts.